I'll be the first to admit that I do tend to prefer high-end highlighters. The formulas tend to be far better and there's less chance of getting a powder filled with glitter. That being said the drugstore and more affordable brands have really upped their game when it comes to highlighters. So I've put together a little edit of my favourite ones that won't break the bank. This little palette is a rather new addition to my highlighter collection. And at nearly £15 it's the most affordable but you do get 5 highlighters. I think the formula is well worth paying for to. Each of these shades are butter soft and translate beautifully on the face. They don't contain any shimmers and aren't chunky at all. They don't emphasise texture or any problem areas either. I have the Cool palette which has some really nice shades in it. It has 2 cool toned, unique highlighters that I don't really use. A cool, off White icy colour and a really pretty Gold. These two shades I love! I've been reaching for this palette pretty much exclusively since I got it! ColourPop highlighters are one of my favourite formulas. They have a really buttery, mousse like consistency. They also come in a huge variety of shades so I think there will be something for every skin tone. My favourite shades are Flexitarian and Wisp. Flexitarian isn't for the faint hearted, it gives a really intense icy highlighter that really catches the light. Wisp is more of a Gold, Champagne colour that isn't as intense but it can still be seen. Although these aren't the cheapest to get hold of in the UK I still think they are worth paying that bit extra for. Milani highlighters are another amazing formula. I can't actually believe more people don't talk about these. Although they are on the little more expensive side, they are worth paying that bit extra for. They are so soft! And give the high points of the face a gorgeous sheen that's not over the top but not to subtle. My favourite shade is Day Glow. Which is a really pretty classic Champagne colour. It suites my skin tone really well. There is quite a few shades available to. I'm so into liquid highlighters at the moment but I've been on the hunt for a more affordable option and I've found this amazing offering from L'oreal. I have the shade Champagne which is a pretty Peachy Champagne colour. These are slightly more subtle than some liquid highlighters I've tried but I don't mind. They look beautiful on, there isn't any glitter in them just beautiful shimmers. These don't disturb my makeup or move throughout the day. If you're looking for an affordable liquid highlighter I really can't recommend this enough. I haven't spoken about this in a while but this is a great highlighter. Again this is slightly more expensive but I'm yet to find a really cheap highlighter that I actually use and would recommend. The formula of this one is exceptional and the shade Santorini Sunset is really pretty. It's a pale Champagne colour. It gives the cheek bones a really nice sheen and the light reflects off this perfectly. Again this doesn't have any glitter particles in it. It's so nice. Definitely one to check out. Like I said earlier I know these are on the pricier side but I'm yet to find one that's really cheap and really good. Have you tried any of these? 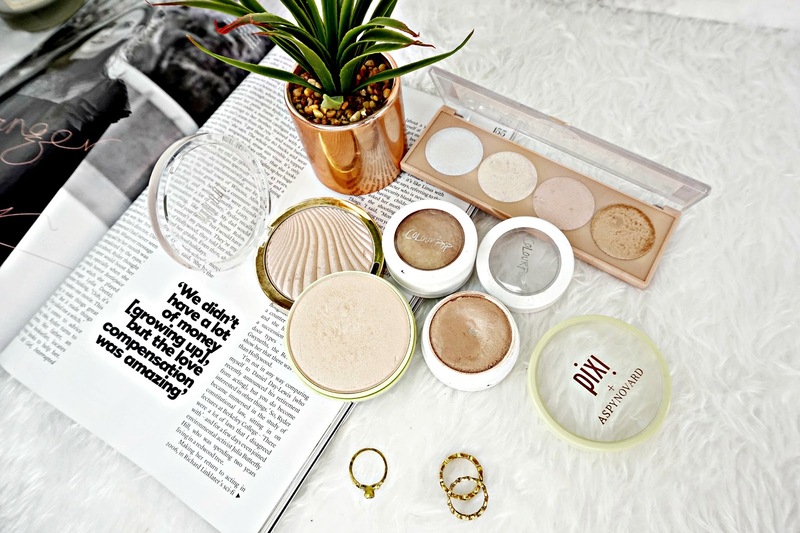 What's your favourite affordable highlighter?